NOTE: This is the second is a series of posts reviewing the book “The Net Delusion: The Dark Side of Internet Freedom.” Here is a link to the first post. In this second post on The Net Delusion I’m going to look at two chapters together. This is not only because there are eleven chapters in the book and I need to double-up sometimes, but also because Morozov himself sets up an amazing thematic juxtaposition: In chapter two he successfully shreds the idea that the Cold War is an effective metaphor for the current Internet freedom debate, and then he begins chapter three by using an extended Cold War anecdote to make arguments about Internet freedom. I really liked the beginning of chapter two. It was just really good, probing, edifying journalism about how the neo-cons got into the Internet freedom game: how the George W. Bush Institute hosted a group of “global cyber-dissidents”, how neo-cons got Congressional funding for Falun Gong to make circumvention tools, how these politicians quickly fell into the inaccurate language of Cold War-speak. Having previously expended so much time and effort on trying to break the Iron Curtain, Western policy-makers would likely miss more effective methods to break the Information Curtain…. Policymakers’ previous experiences with solving similar problems, however, block them from seeking more effective solutions to new problems. This is a well-known phenomenon that psychologists call the Einstellung Effect. Physical walls are cheaper to destroy than build; their digital equivalents work the other way around. Likewise, the “cyber-wall” metaphor falsely suggests that once digital barriers are removed, new and completely different barriers won’t spring up in their place – a proposition that is extremely misleading when Internet control takes on multiple forms and goes beyond the mere blocking of web sites. These are all good points, but before I discuss the way Morozov falls into his own Cold War intellectual trap in chapter three, I’d like to take a moment to analyze the rhetorical choices in chapter two. Just as he chose his opponents’ weakest argument (“Twitter Revolution”) in chapter one in order to score rhetorical points by playing Harlem Globe Trotters to their local losers, he makes two careful omissions in this chapter to make the idea of Internet freedom seem intellectually bankrupt. 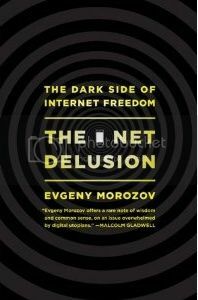 In this chapter Morozov treats the idea of Internet freedom (and, by extension, cyber-optimism) as having uniquely neo-con roots. Picking an intellectual fight with a neo-con in the post-Bush era when the US is still mired in Iraq and Afghanistan and an American diplomat cannot say the word “democracy” without being perceived as an imperialist is like attacking US isolationalists after Pearl Harbor – their intellectual pedigree has been so successfully degraded by actual events that they make an easy target. By treating the idea that ICTs can have deleterious effects for authoritarian regimes and that policies should be developed around that idea as a neo-conservative one, Morozov hopes to make the idea invalid by association. I know many people who believe that the Internet can have these positive effects for activists and pro-democracy proponents : Ethan Zuckerman, Yochai Benkler, and Jillian York at Harvard, Patrick Meier at Stanford, Philip Howard at the University of Washington. Not even one of them is a neo-conservative. They draw their optimism not from past intellectual frameworks but from observation of current phenomena. In Morozov’s mind, digital repression is a reality of multiple amusing anecdotes, but digital activism and the use of digital technology against repressive regimes is just an idea. Yet there are hundreds of examples of members of civil society using digital tools to broadcast alternative political narratives, coordinate anti-government actions, transfer resources, create a shared awareness of shared grievance, and mobilize protest. If Morozov needs some examples, he can download the list of 1,000 cases in the Global Digital Activism Data Set. Digital resistance to authoritarianism is real, not just the misconception of neo-cons. Yet it is easier to invalidate a phenomenon if you pretend it doesn’t exist. Anachronistic language skewers public understanding of many other domains of Internet culture, resulting in ineffective and even counter-productive policies. The similarities between the Internet and technologies used for samizdat – fax machines and photo-copiers – are fewer than one might imagine. This is all true, so why, after critiquing “anachronistic language” and Cold War thinking does he launch into an extended anecdote about how cable TV undermined democratic aspirations in East Germany during the Cold War? If he is savvy enough to argue that the similarities between fax machines and photo-copiers and the Internet are few, how can he allow himself to overlook the differences between the Internet and television? Read-write capacity, consumers becoming content creators, media fragmentation, the “former audience” – these are not new ideas. Broadcast hasn’t been an accurate metaphor for the Internet since the beginning of the millennium, and Morozov knows this. By comparing the complacency created by Western TV in East Germany to the complacency created by web TV from the likes of Russia.ru today, he is doing exactly what he excoriated the neo-cons for: using a “Cold War metaphor” to suggest an understanding of digital repression in the modern day. So why does he do it? For the same reason that he makes so many rhetorical choices in his book: because its easier to defeat a proposition if you pretend it does not exist. It is no accident that nearly every case in the Global Digital Activism Data Set involves self-publication of user-generated content. Content creation is crucial to most of the elements of successful digital activism: offering alternative narratives, creating a sense of shared grievance, mobilizing supporters. By choosing a metaphor from the broadcast era of television – and pretending it is analogous to the Internet era – he also pretends that the creative capacities of the “former audience” not only are unimportant but also don’t exist. Winning arguments by cherry-picking weak ideas that he can easily defeat and pretending that challenges to his rhetorical view do not exist is poor journalism and poor rhetoric. Morozov is an excellent writer and analyst capable of winning arguments even when he has not tilted the field of play in his own favor. Perhaps for all his bombast he is less intellectually confident than he appears. Thanks for the reviews of Morozov’s book. I just finished reading it myself and agree with your assessment of his arguments. I felt that ultimately he was simply pleading with the United States government to modernize its relationship with the Internet. He urges them to depart from the tired Cold War mentality and viewing the Internet as just a digital version of Radio Free Europe but as you noted he seems to ultimately want them to use the Internet as a tool for promoting the “American” version of democracy. I read it as a veiled request to revitalize the old neo-con imperialism that the United States focused on throughout central and south America over the past 50 years. I wonder what his take on the recent events in Egypt, Libya, Tunisia, Bahrain, and Oman would be in an updated edition of the Net Delusion? Would he remain as dismissive of the usefulness of social media in organizing these movements as well? The visibility of these protests and revolutions to citizens of other nations must certainly have some sort of impact on their own motivations and confidence. It would seem that there is a sense of solidarity that is spreading albeit not through social media alone.